Between 1970 and 1995, tenor saxophone player Pharoah Sanders was recording for a number of different small independent jazz labels. One of those labels was Netherlands based, Timeless. He recorded three LP’s for the label ,“Africa”, “Moon Child” and “Welcome to Love”. Now Dopeness Galore have compiled the highlights of these records on this solid eleven track compilation. On his Timeless debut “Africa”, Pharoah Sanders (1940), intended or not, makes a link to the past. Not only does he pay explicit tribute to his late mentor John Coltrane, he is also joined by pianist John Hicks, who was part of Sanders’ first ensemble in 1963. 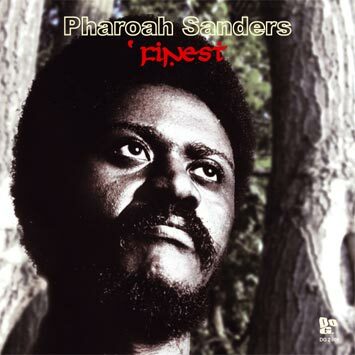 By that time Pharoah Sanders was living in New York, and was struggling to make a living, at times sleeping on the streets. It was joining Coltrane’s ensemble which brought Pharoah Sanders stability and wide acclaim. After Coltrane’s passing, Sanders continued to work with his wife, Alice. On “Welcome to Love”, playing a series of famous ballads, the thin, reserved approach is reminiscent of Coltrane. However, it is still marked with Pharoah's trademark sound. The CD version is out early November (Japan), early December (World) together with a limited 10” (DG 2005s) both featuring liner-notes from Sjeng Stokkink (Jazzism Magazine) and Mitsuru Ogawa (Dance Music Records, Japan). Laurent Garnier: "this sounds absolutely awsome PPPLLEEAASSSEEEE could i get a copy of the entire album ,i would realy looOOOve to hammer it on the radio"
REVIEW Straight No Chaser (Amar Patel): "Blessed with his signature penetrating lyricism, harmonic richness (‘Africa’ with John Hicks sitting in) and heavy overtones (‘Origin’) this Timeless compilation is a no-brainer for those who may have turned away from Sanders after 'Rejoice' and 'Journey To the One'. Because whether it’s 1967, 1987 or 2007, The Pharoah teaches you live, love and feel; and for that, we give eternal thanks." Daz-I-Kue (Bugz in the Attic): "All I have to say....is pure inspiration"
Finn Peters: "This comp looks fantastic! I don't have any of the Timeless Pharaoh records and I imagine that they are pretty hard to get hold of"
Joscha (UpMyAlley): "I`d love to hear that stuff, sounds great! Havent heard any of the stuff he did on timeless, sounds promising!" Nick Rees (GOYA Music): Respect! Alex Attias: "thank you very much for this beautiful cd full of amazing tracks. Im a big fan of Pharoah 's music and have most of his records on vinyl but this cd is a very great idea and superb selection to let more people know about this incredible musician. full support from me." Raggy (Offlimitsradio): "thanks so much for the LP cdr, I finally got around to playing a track from this wonderful compilation on my latest radio show (#44). Great stuff, always been a massive fan of this mans music and it was good for me to hear a different version of such classics as 'you got to have freedom' and 'moon child' 10/10 !!"